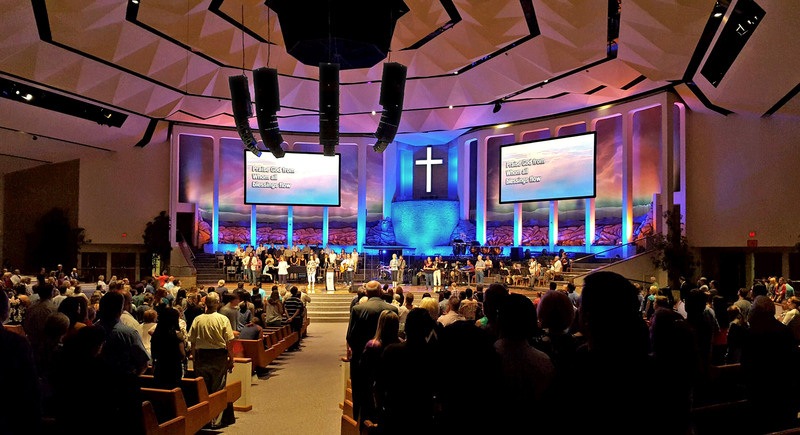 The recently commissioned VUE al-Class line array based system at Austin’s Great Hills Baptist Church is drawing rave reviews from Church leadership, sound engineers, and worshipers alike. Designed by Springfield MO -based Paragon 360, the VUE al-Class hybrid line array system replaces an old JBL Vertec rig, and is the first step in a multi-phase electro-acoustic renovation. 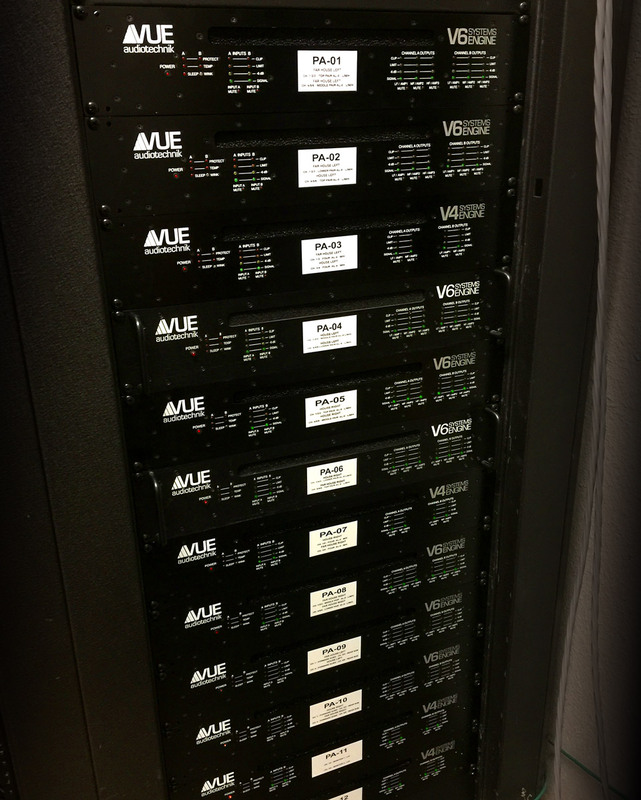 Thanks to VUE’s unique Continual Source Topology (CST) which enables the assembly of seamless hybrid arrays of different-sized elements, the al-Class was the perfect solution to address coverage issues and provide improved clarity throughout the 3,500-seat venue. 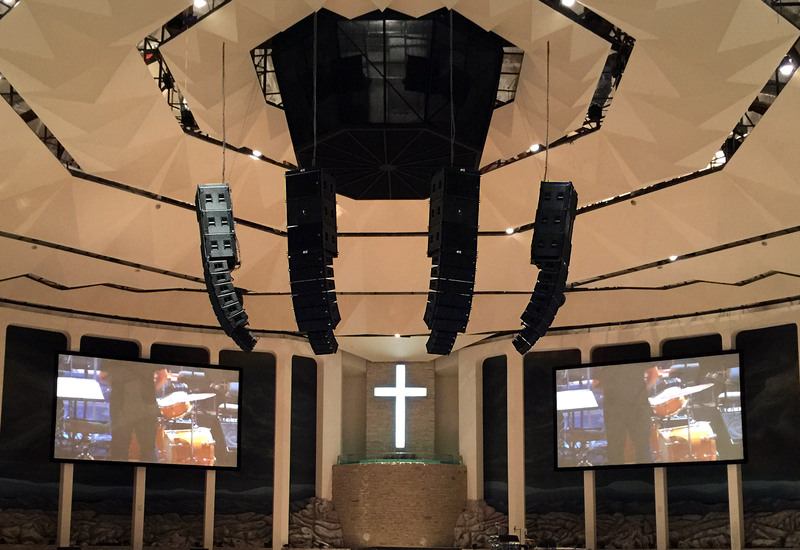 To deliver consistent 180-degree coverage across the half-circle-shaped sanctuary, Paragon 360’s lead audio designer Mark Coble specified four discrete arrays incorporating six al-8 elements with four subcompact al-4s for near-field coverage. VUE’s proprietary CST technology virtually eliminates the transition between the al-8 and al-4 elements resulting in exceptional near-field coverage with consistent fidelity, optimal line length, and minimal weight. Capping each array are three al-8SB flyable 18-inch subwoofers in a cardioid directional configuration. VUE presets courtesy of the VUEDrive Systems Engines handle the phase and frequency settings for the cardioid configuration making setup and tuning quick and easy. The system also included a monitor package with six hm-112 h-class single 12-inch high output monitors, and V4-i VUEDrive Systems Engines. In addition to coverage uniformity, Paragon also set out to ensure that the cardioid sub array eliminated the previous system’s issues with stage and rear wall low-frequency interference. “The versatility of the VUE system allowed us to very easily go the cardioid route and solve this long-standing issue, while keeping the newly installed orchestra section clear of excess low-frequency energy,” remarked Nelms. Paragon 360 is an award-winning, design leader in the professional AVL industry. With an extensive client base, the company is dedicated to building highly effective and engaging environments for churches, businesses, schools, museums, live events, and others with requirements involving professional audio, video, lighting, rigging, scenic and staging in a design/build format. Representing hundreds of the world’s finest and most reputable AVL brands, Paragon 360 is uniquely positioned to match every client’s needs without compromise. The brand is equally well-known for its turn-key project delivery and unparalleled dedication to excellence, pledging every project to be On Time, On Target, and On Budget. For more information on the quality-driven expertise within Paragon 360 as well as its broad range of products and services, visit www.paragon360.com or call 417-823-7282.